St. John's wort (Hypericum perforatum) is a flowering plant named because the bright yellow flowers were said to bloom for the first time around St. John the Baptist's birthday. The word "wort" means "plant" in Old English. People have been using St. John's wort for centuries. Today, the popular herb is often used to ease the symptoms of depression. An oil made from St. John’s wort has also been used topically for wound healing and for a variety of other skin conditions such as eczema and hemorrhoids. Scientific studies have shown St. John's wort to provide certain benefits related to depression. Although the benefits of St. John's wort are still being explored, overall, the evidence suggests that St. John's wort may be more effective than a placebo in alleviating mild-to-moderate depression. A 2015 study published in the Annals of Family Medicine, for instance, examined whether antidepressants were more effective than a placebo in a primary care setting. For the analysis, scientists examined 66 previously published studies (with a total of 15,161 participants) and found that antidepressant medication and St. John's wort extracts were more effective than a placebo. St. John's wort was associated with fewer dropouts because of adverse effects compared to tricyclic and tetracyclic antidepressants, selective serotonin reuptake inhibitors (SSRIs), a noradrenaline reuptake inhibitor (NRI), a serotonin-noradrenaline reuptake inhibitor (SNRI; venlafaxine), and noradrenergic and specific serotonergic antidepressant agents (NaSSAs). The most comprehensive research on St. John's wort and major depression includes a report published in the Cochrane Database of Systematic Reviews in 2008. For the report, researchers looked at 29 previously published clinical trials (with a total of 5489 participants) that compared the effects of St. John's wort to a placebo or standard antidepressant medication for a period of four to 12 weeks. 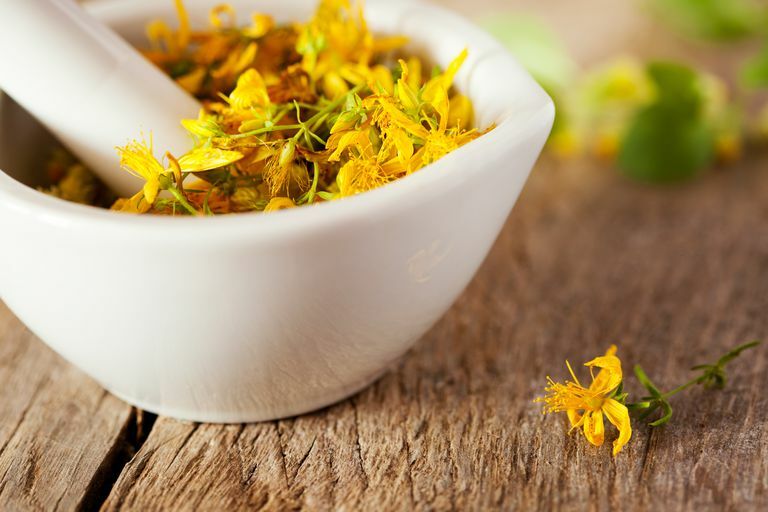 In their analysis, the study's authors found that St. John's wort extracts may be more effective than a placebo and were as effective as standard antidepressants, but the herb appeared to have fewer side effects. The authors noted in their analysis that the studies conducted in German-speaking countries (where St. John's wort has a long history of use and is often recommended by physicians) reported more positive results than studies conducted in the United States and other countries. St John's wort can have very serious interactions with a large number of commonly used medications because of the way it's broken down in the liver. The herb can decrease the effectiveness of medication but it can also make the effects of a medication stronger. While the long list of medications includes antidepressants, warfarin, cough and cold medicine, immunosuppressants, oral contraceptives, medication for cancer, heart conditions, and HIV/AIDS, sedatives, blood-thinners, and antibiotics, as well as many herbs and supplements, you should consult your physician and pharmacist before taking it with any medication or supplement. Taking St. John's wort, while you are also taking certain antidepressants (or any substance that raises serotonin), has been associated with serotonin syndrome, a potentially dangerous condition resulting from an excess of serotonin. Symptoms may include confusion, fever, hallucinations, nausea, loss of muscle coordination, sweating, and shakiness. If you experience any of these symptoms, stop taking St. John’s wort and seek immediate medical attention. Certain supplements (such as 5-hydroxytryptophan (5-HTP), L-tryptophan, and SAMe) may also increase serotonin and should be avoided. St. John’s wort (both oral or topical) can increase the sensitivity of your skin and eyes to sunlight. If you have a condition or are taking medication that increases your skin's sensitivity to sunlight, talk with your doctor to weigh the risks. In published studies, the most common side effects associated with short-term oral use of St. John’s wort supplements have included mild stomach upset, allergic skin reactions, tiredness, restlessness, anxiety, sexual or erectile dysfunction, dizziness, photosensitivity, vivid dreams, diarrhea, tingling, dry mouth, headache, and liver injury. Psychosis is a rare but possible side effect. Side effects associated with topical use include skin rash. If you are pregnant, breastfeeding, trying to conceive, or you are taking oral contraceptives, it's important to talk with your doctor before taking St. John's wort. There is some concern that St. John's wort may worsen symptoms in people with attention deficit-hyperactivity disorder (ADHD), bipolar disorder (it may bring on mania or speed up the cycling), major depression, schizophrenia (may increase the risk of psychosis), and Alzheimer's disease. It shouldn't be taken by organ transplant recipients. St. John's wort should not be taken within two weeks before a scheduled surgery. Some sources caution that the use of St. John's wort for six months may lead to heart complications in people undergoing surgery with anesthesia. There is not enough scientific data to provide a recommended dose of St. John's wort. But there are doses commonly used in research to investigate the herb's effect on depression. For example, in most studies, St. John's wort is used at doses of 300 mg three times daily (when the extract was standardized to 0.3 percent hypericin content). Some studies have used St. John's wort extract standardized to 0.2 percent hypericin at doses of 250 mg twice daily and when the extract standardized is to 5 percent hyperforin, St John's wort has been used at doses of 300 mg three times daily. St. John's wort is sold widely in drug stores, grocery stores, and health food stores. The supplement comes in a variety of doses. It is important to check the Supplement Facts label for the product you choose to make sure you are getting the appropriate dose. This label will also provide information about other ingredients that may be in the supplement that you choose. Lastly, the National Institutes of Health suggests that you look for a product that contains a seal of approval from a third party organization that provides quality testing. These organizations include U.S. Pharmacopeia, ConsumerLab.com, and NSF International. A seal of approval from one of these organizations does not guarantee the product's safety or effectiveness but it does provide assurance that the product was properly manufactured, contains the ingredients listed on the label, and does not contain harmful levels of contaminants. Should I take St. John's wort to manage depression? If you or someone you know is living with depression, you may be seeking different options to manage your symptoms. While the research on St. John's wort is promising, it's crucial that you work with your health care provider and discuss whether it's appropriate for you, rather than trying it on your own. Delaying or forgoing standard treatment can have serious consequences. Given the lengthy list of possible drug interactions, it's also important that you tell all of your healthcare providers and your pharmacist to make sure you're not taking anything that might interact with St. John's wort. Linde K, Kriston L, Rücker G, et al. Efficacy and Acceptability of Pharmacological Treatments for Depressive Disorders in Primary Care: Systematic Review and Network Meta-Analysis. Ann Fam Med. 2015 Jan-Feb;13(1):69-79. Linde K, Berner MM, Kriston L. St John's Wort for Major Depression. Cochrane Database Syst Rev. 2008 Oct 8;(4):CD000448. Does St. John's Wort Have Any Drug Interactions With Antidepressants? What Are the Side Effects of Wellbutrin (Bupropion)? What Side Effects of Zoloft Should I Be Worried About? Can Can 5-HTP Treat Depression? Should You Take Antidepressants Long Term?